Sometimes I receive emails from fans and friends who tell me the cat they share a home with looks just like me. Well, who wouldn’t want to look like Nora The Piano Cat, right? And occasionally the photos they send really do look like me. Like yesterday, when I received the photo of Sugar, who lives in Pennsylvania with her human companions. Wow! 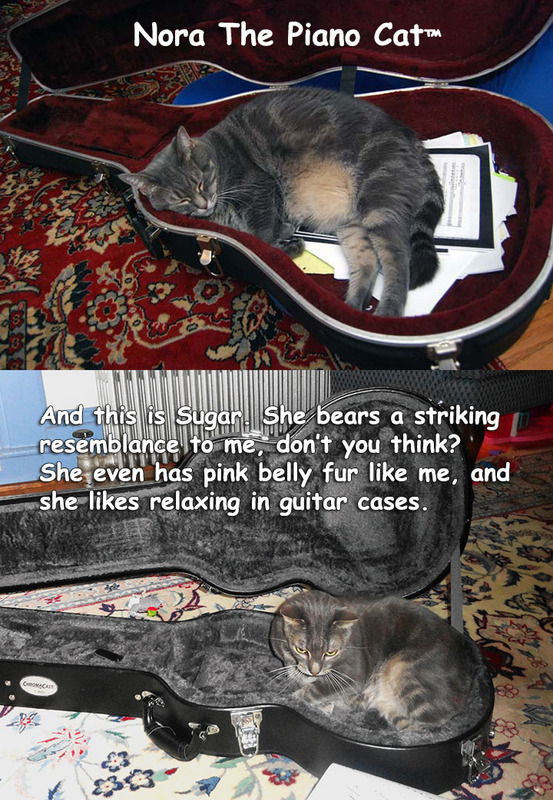 Not only does Sugar have my fur and my body type, she also finds a plush-lined guitar case a great place for hanging out – just like me! How cool is that? Wow, that is a pretty amazing resemblance!